With the help of the ClassiPress Classified Ads premium wordpress theme you will be able to instantly turn your WordPress blog into a professional Classified Ads Web site in no time with almost no efforts. 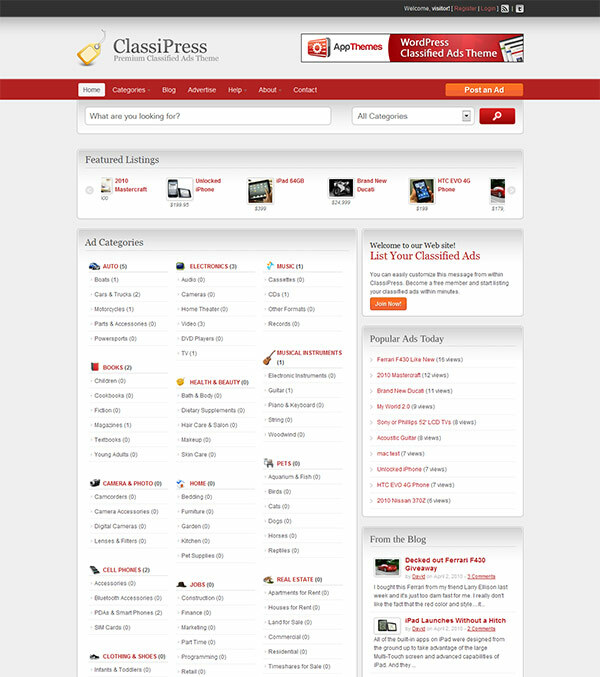 ClassiPress is the most popular and widely used classified ads software for WordPress in the world today. This feature-rich theme was built for ease-of-use and tight integration with WordPress so you’ll be online and selling classified ads within minutes. With thousands of ClassiPress customers, a dedicated support team, and a very active community, you can trust that ClassiPress is here to stay. ClassiPress takes full advantage of the latest features available in WordPress 3.0. Ad listings are now kept totally separate from your blog posts so there’s no more confusion. You can choose from five different color schemes and two different page layouts. You can also upload your own logo and banner ads which makes it easy to brand your site. The theme includes powerful options that can change how your site runs without requiring a developer. It’s all GUI-based with detailed help on each option so you know exactly what you’re doing. ClassiPress uses the de-facto WordPress GNU gettext localization framework. This means it’s easy to drop in a new language file without touching any code. Free language packs are also available for some languages. You can also setup unlimited coupons, email your customers with time sensitive offers, and watch your pipeline fill up. The new coupon module allows you to do it all. Your customers get their own personalized dashboard where they can edit, view, pause, and even re-list their ads. They can even modify their profile and change their password. Completely self-managed options. Images uploaded with each ad are automatically re-sized into three different sizes. All images are accessible from within the WordPress media library which makes management a breeze. Choose from three different pricing models or just mix and match free and paid ads. ClassiPress also includes an Ad Package module so you can create your own custom terms. Easily create your own custom fields & forms with our simple builder. Each category can have it’s own set of custom fields. You decide the order, field type, and if it’s a required field. It’s really that easy. Having a smart search engine is important – especially for a classified ads website. Besides having one of the most accurate WordPress search engines, ClassiPress now includes two new powerful search features that will really impress your visitors. ClassiPres allow visitors to “Like” you and proudly display your friend connections on your website with this powerful Facebook widget. This will help you grow your Facebook. ClassiPress includes a built-in ad counter which keeps track of daily and overall ad views. In addition, you get two ad statistics widgets so you can display your most popular ads on any page. With built-in payment gateway support, you can start collecting payments for new ads almost immediately. Currently there is support for PayPal, but the theme will eventually include several other gateways. Communicating with your customers with ClassiPress is easy. The theme includes a customizable new user registration email template (instead of the bland WordPress default one), so you decide exactly what messaging you’d like to send out. The ClassiPress theme for WordPress is built to instantly take advantage of SEO best practices so all you need to worry about is running your business.